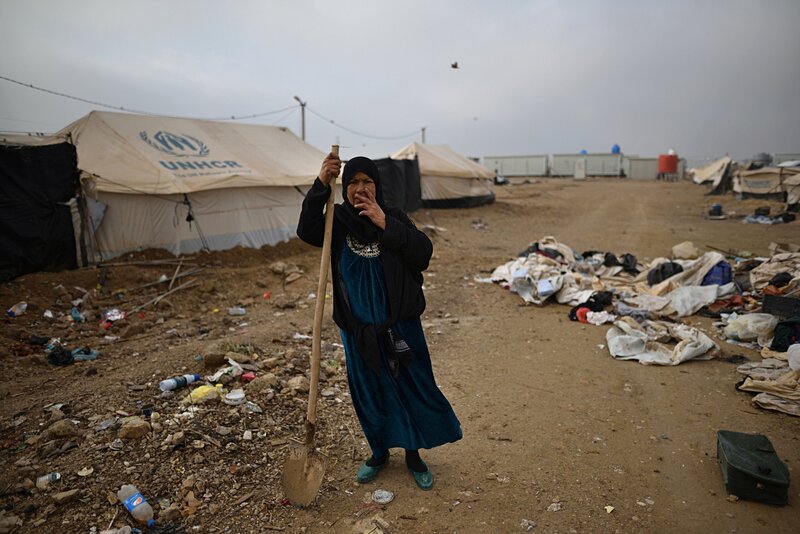 BZEIBIZ, Iraq — It was a cold and gusty day in December when the army came to the Bzeibiz camp and told families displaced by the war against the Islamic State group that it was time to go home. The fighting was over, they said, and the camp west of Baghdad was going to be closed. Some of the families protested that they had no homes to return to. The army said they would be sent to Amariyat al-Fallujah, a remote camp ringed by chain-link fences and barbed wire. In the next few days, close to 800 families filed out, according to family interviews and U.N. data. A little over a year since the country fought its last battle against the Islamic State group, but well before it has gotten a handle on reconstruction, Iraq is closing its camps for the displaced in western Anbar province and casting vulnerable families into a maelstrom of peril. Many families cannot return home, accused by their tribes of collaborating with IS. Others worry there is no work, schooling, or housing to return to. Stragglers are being sent to two tightly-controlled camps deep in the plains of Anbar, where military authorization is required to leave. “We were displaced once because of IS. Do we have to go through this again because of the government?” said Hamid. When IS militants swept through north Iraq in 2014, they triggered a migration and displacement crisis unprecedented in Iraq’s history. Millions fled their homes in the face of the militants’ rapid advance; others fled as Iraqi forces, backed by the U.S. and Iran, battled back, ultimately reclaiming the last town in late 2017. Some 1.8 million people out of Iraq’s population of 38 million are still waiting to return to their communities. Destitute, homeless, and unprotected by the courts, displaced families have borne the brunt of the political and personal score-settling underway in post-war Iraq. Since liberation, thousands of men have been swept up in arrests for alleged affiliation with IS — more than 19,000 in prison as of March 2018 . Many of them have been pushed through cursory trials lasting only a few minutes that often end in convictions and death sentences. Between June and December 2018, Iraqi security forces closed three of the Anbar’s five displaced persons camps — Bzeibiz, Kilo 18, and Khalidya — which together sheltered more than 12,000 people, according to U.N. figures. At least 3,000 of them were pushed into the Amariyat al-Fallujah and Habbaniyah Tourist City camps, already the largest in the province. Maj. Gen. Mahmoud Khalaf Al-Falahi, commander of the armed forces in Anbar, said the army was doing its utmost to return families to their communities of origin, while consolidating the remaining camps to provide better security and services. “If these camps stay, then we are going to raise another generation of ISIS,” he said. At Bzeibiz, families had just days to pack their belongings. Several families said officers collected personal information and fingerprints that, they were told, were for IDs. “But three or four days later, an officer came and said, everyone get out, because you all gave your fingerprints. We didn’t know about this provision. We signed for badges,” said Naima Abd, 37. The camp had housed 4,896 people, or 831 families, according to a Dec. 15 U.N. census. When The Associated Press visited four days later, it was nearly deserted. Empty tents sagged under the winds, and discarded furnishings littered the dirt lanes. Hamid, who worked at a medical charity in Bzeibiz, said only 47 families had remained. Hundreds were moved to much harsher circumstances in Amariyat al-Fallujah, fifteen kilometers (9 miles) to the west and host to more than 21,000 people. Schools are understaffed, and clinics are not equipped to provide the specialized care that many war victims require, such as treatment for chronic pain, nerve damage or blindness. Guards make sure no one leaves the camp without army permission. “Some of the people being held in Amariyat al-Fallujah are, de facto, in detention,” said Belkis Wille, senior Iraq researcher at Human Rights Watch. Qusay Jasser, 54, said he was selling his food rations to pay for regular appointments to treat his daughter’s eyes at a hospital in Baghdad. But some weeks, the guards do not let them through. They demand a fresh letter from the hospital confirming each appointment. “There are 100,000 hurdles to leaving,” said Sabah Ahmed, a Bzeibiz resident who wound up in Amariyat al-Fallujah. Al-Falahi, the Anbar commander, said all humanitarian cases were allowed through checkpoint at the camp entrance. But he said the Army has an obligation to secure the camps against militants circulating among displaced families, an assertion that could not be verified because of restrictions placed on the media. Conditions were similarly severe at the Habbaniyah Tourist City camp, with a population of 11,706. A military detail followed the AP around the camp and photographed reporters interviewing residents. Residents said food rations were inadequate and families were huddling together in unheated tents to stay warm in near freezing temperatures. Camp residents may leave to work, but there are no settlements for miles around, except for the nearby resort which lends the camp its name. It’s only open in the summer. On Dec. 5, the army moved 190 families to Habbaniyah after closing Kilo 18 in much the same way it closed Bzeibiz approximately two weeks later. Kilo 18 suffered from winter floods, but it had a free clinic, a delivery room, a psych center, and a center for victims of gender-based violence — facilities not available at Habbaniyah. Hassan Jalal, 80, from Kilo 18, said he did not choose to move to Habbaniyah; he wanted to return home. He produced military documents showing that he had been checked by six security agencies and against 10 witnesses to confirm he had no links to IS. But two of his sons, now deceased, had been members of the jihadi group, and his village’s mayor barred him from returning with his family. “I hope day after day to return home. Even if I have to eat dirt, it’s better than living in this humiliation,” said Jalal. Even families that make it home are finding conditions trying beyond their imagination. Hadi, a father of five who asked for his details to be withheld to avoid friction with the authorities, removed his children from school in Bzeibiz to return to his village near al-Qaim, one of the last cities liberated from IS in 2017. But when they arrived they found that their home was damaged and the local school was shuttered. The children are now sitting at home with their parents. The nearest school is miles away. “We don’t have a car, and I can’t find any work,” said Hadi.